The versatility of the Gold Room allows for a wide range of social and corporate functions from weddings to company retreats, banquets to board meetings. The Gold Room features its own entry from the foyer of the Lodge, and windows on three sides that let the beautiful views flow into the room. Double glass doors lead to the wide patios overlooking the practice green and golf holes. A low stone fire pit warms the air on cool evenings. The experienced staff and professional chefs will plan and execute the catering of your event to perfection. The scene looks as if it might have come from the 1850s. An old pump organ wheezes musical accompaniment as the newly married bride and groom emerge triumphantly from the little white church on the hill. Garlands of native redbud and acacia entwine stair railings at the door of the old building. The happy couple clambers into a horse-drawn carriage and is whisked off to a garden reception at an old country inn. 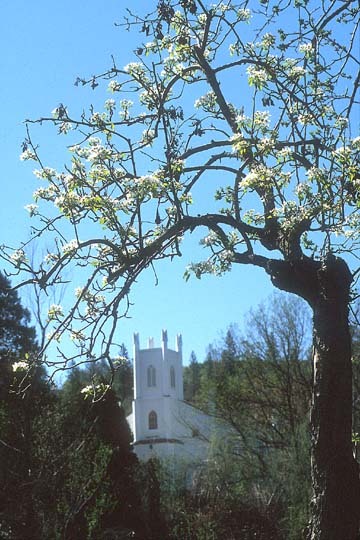 The Emmanuel Church, built in 1855 and pictured at the right, is but one of dozens of unusual settings for weddings in the Sierra Nevada foothills. Wineries, bed and breakfast inns, apple ranches, spacious old-fashioned gardens and even lovingly landscaped county fairgrounds all offer outstanding venues for weddings large or small. The outdoor settings are generally available from spring through fall. Check with individual sites for specific dates. These listings are by county. Our primary resource for the listings is the book, Where to Have Affairs: Unique Locations for Business and Private Special Events in California’s Historic Gold Country, by Carol Cullen Nelson. The book contains much more information than can easily be presented here. It’s available for $19.50, including shipping and handling, from ‘Riba Communications, P. O. Box 1681, Diamond Springs CA 95619; (530) 642-0100.